Beautiful prong set stones in a half halo setting make this ring guard the perfect compiment to any style engagement ring. Add it onto your solitaire, three stone ring, or halo engagement ring to create the perfectly stunning bridal ring guard set. Made in the highest quality of and set with the most brilliant and vibrant Round you can imagine, this ring guard enhancer will blow you away. At TwoBirch, everything we sell is made to order, so while this ring enhancer is made to fit a standard solitaire, it can be made to fit your ring at no charge. You can simply select the PerfectFit option. Pressed for time? No worries. Email us images of your ring and we will modify your ring enhancer at no charge. Contact us for more details. At TwoBirch, we build or jewelry to last a lifetime. Our rings are solid, not hollow, and with simple care, will last a lifetime. Set in with gorgeous Round, you will be amazed at how beautiful your TwoBirch jewelry will be. Search TB-GUARD-0114 on Amazon.com search bar above to see this ring enhancer with all of its variations. 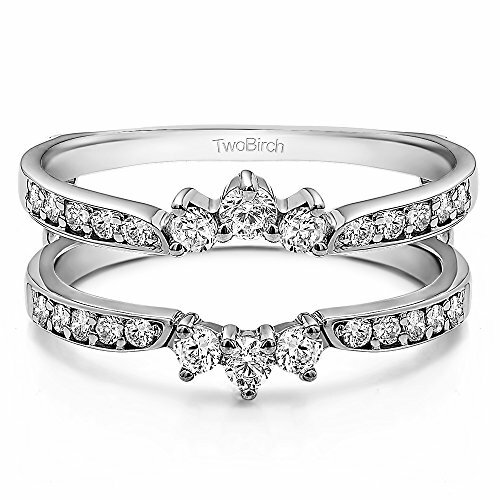 All TwoBirch ring guards and ring wraps are available in platinum, gold , silver, diamond moissanite and cz.